An increase in the number of users and manufacturers of ultrafast lasers drives new requirements for development, characterization, or QA/QC of the optics and coatings used by these advanced instruments. For ultrafast laser systems and applications using ultrafast lasers, accurate knowledge and control of each wavelength’s relative phase is required for optimal results. For ~500-fs pulses, knowing the effects on phase of bulk optics such as laser rods and prisms is sufficient; however, for pulses on the order of 100 fs or less, the phase contributions from mirrors and lenses become increasingly important. To get the shortest pulse out of an ultrafast laser system, the relative phase of every wavelength must be lined up and accounted for. Various wavelengths have different phases because the index of refraction of every optical component, from laser rod to mirrors to air, varies with wavelength. This variation in index is called dispersion and results in an arrival delay of the wavelength group. In real materials, because this group delay varies with wavelength, the variation is called group delay dispersion (GDD). Knowing the GDD of all the optics in an experiment lets you compensate for it, resulting in clean, short pulses that increase the signal-to-noise ratio (SNR) for most experiments. In the manufacture of optical components for ultrafast application (mirrors, AR coatings, thin film filters, etc. ), it is very important that you measure the GDD specification that is required for the application. Reflectivity and Transmission measurements are not acceptable stand-ins for measuring dispersion to demonstrate specification, as dispersion does not follow R and T for ultrafast optic coatings. Users of these ultrafast optical coatings require measurements of dispersion specifications before they are used in their optical set-ups. In ultrafast laser manufacturing and laser development, similarly, you need to measure the dispersion properties of every coating and element that is used inside the ultrafast laser system. One bad optic can ruin the performance of the entire laser system or can even cause the system to output no short pulses at all. Most high performance ultrafast laser companies have an instrument on-site to measure dispersion of optics as part of the incoming inspection process. The gold standard for measuring dispersion of ultrafast optics is the white light interferometer, where a broadband light source is split into two paths: reflected off from a reference mirror (typically a low-dispersion metal coated mirror) and the optic under test, then recombined. As the reference mirror is scanned in time, a photodiode or spectrometer records patterns that are analyzed to give the dispersion of the optic under test. A laser (HeNe) can be used to calibrate the distance scan so the instrument is immune to vibration. The ideal instrument is broadband, self-calibrating, takes measurements in minutes, and is built for the ease-of-use of operators on a manufacturing floor, with the advanced features required by engineers and researchers. 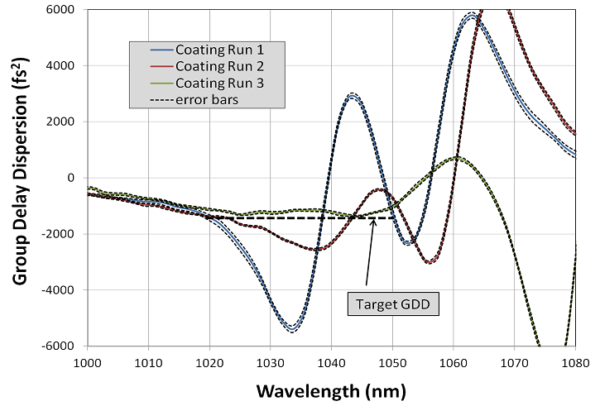 KMLabs has developed Chromatis, a white light interferometer (WLI) to measure GDD to give users of ultrafast laser systems, beam delivery optics, and optical coatings assurance of optimal ultrafast laser performance and experimental results. It is the only robust, repeatable, operator-friendly dispersion measurement system for verifying the performance of ultrafast coatings and optics in a production and quality-control environment. Customer coating development example for a chirped mirror designed at 1035 nm. Coating 1 distorted the end-user’s laser pulse badly, Coating 2 less badly, and Coating 3 was ideal. Measuring dispersion was the only way to get this coating correct.